... it's difficult to imagine how a brand based on a name like Sockeyes could successfully distinguish itself from the current Canucks identity. Frankly, in my opinion, all NHL Seattle has to do in order to establish a brand package that distinguishes itself from that of the Canucks is to (a) adopt a color scheme that clearly diverges from Vancouver's current blue, green and white palette, and (b) opt for a logo that embraces a design aesthetic that is more authentically indigenous in style than the painfully contrived - and visually clunky - letterform created from a mash-up of pseudo-Northwest Coast art orca and stylized depiction of shattered ice. Only time will tell if either happens. However, if NHL Seattle were to adopt either the color scheme on display on its website (red, black, dark grey, light grey, white), or one drawn from Coast Salish art (black, red ochre, and that almost teal blue), that would certainly be distinct from what the Canucks currently sport. 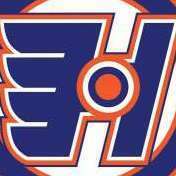 Further, if the team has - in fact - reached out to a Coast Salish artist such as Louie Gong, it is reasonable to expect that a logo designed by such a craftsman would be more authentically indigenous in style than the Canucks' bastardization. Orca Bay-inspired logo. The Canucks' orca is a cheap version of First Nations art. 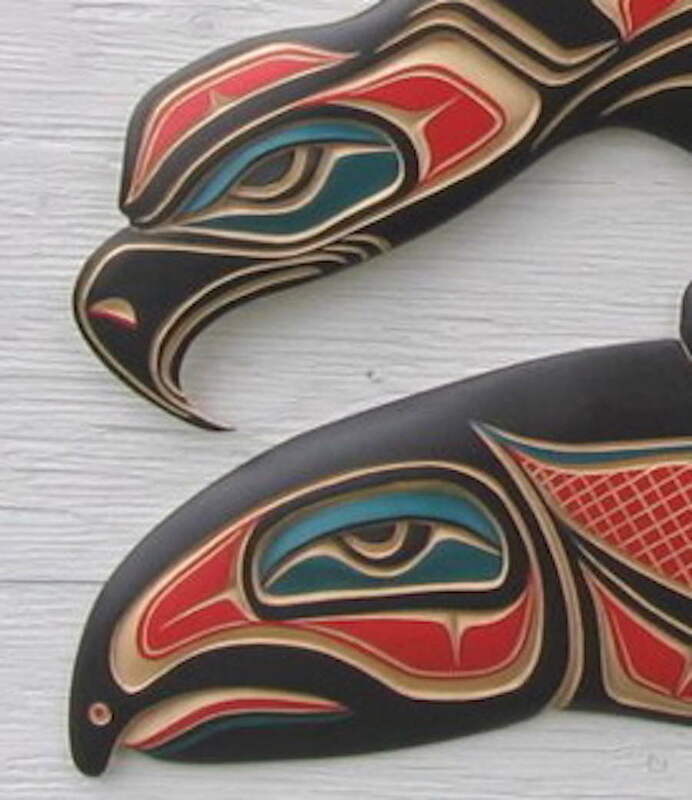 The Canucks' orca is an unlicensed version of First Nations art. Fixed, while presenting a more troubling angle than the original post. Have any First Nations groups within British Columbia ever come forward with approval/disapproval of the design? My initial thinking was "great, another red and black team" but maybe they will be black and red. They can use the sweater color combo that the Senators refuse to use anymore. Pretty sure it's impossible to trademark/license a style of art. I don't think the Coyotes' Kachina jersey has even been officially approved by a Native group, nor do I think the Ottawa Senators' logo was ever approved by a group in Rome. I don't think Monet ever said "Only the French can do impressionist work". Fixed(doesn't need fixing), while presenting a more troubling angle than the original post. Have any First Nations groups within British Columbia ever come forward with approval/disapproval of the design? For your information, no First Nations groups have come forward. The orca was designed by Vancouver artist Brent Lynch. He also designed a Johnny Canuck logo for the Canucks but Orca Bay wanted to push their corporate brand in the Canucks' identity. Therefore, the cheap First Nations-knock off orca was chosen. Also it’s not a 1 for 1 takeaway from indigenous art. It’s just a weird, weird cluster:censored: of a logo that has a few details around the head reminiscent of a broad range of art native art styles. Romans and the French aren’t historically-oppressed groups. They haven’t had their cultural symbols taken out of context by white groups, all while seeing none of the profits. That is why you need tribal approval for anything First Nations-inspired. Better yet, hire First Nations artists. It’s just corporate promotion, not cheap. There probably wasn’t much cost difference between the two logos. The mishmash aspect of it is far more insulting than its “corporate” origins. "Approval" has a completely different legal meaning than "license" though. The latter involves financial compensation, the former does not. And it's hard to trademark a style of art (of any kind) because of the term "inspiration". Eminem was never sued for being inspired by music that was created by historically-oppressed black people. Just a heads up we’re heading towards territory that’s not admissible discussion on this board. Without straying too much farther into the danger zone, I think it's worth noting that these questions about appropriation and authenticity are likely weighing on the Seattle group as well, and much like the potential asthetic overlap with Vancouver, there's likely lots of debate taking place on the merrits and drawbacks of a wide range of approaches. While there seems to be a strong interest here in seeing a team fully commit to an indigenous based brand, I wonder if the rumors about a "water-related" mascot might signal a brand that is more in line with the Mariners than the Seahawks. It could be interesting to see a team adopting maritime inspired design as part of their brand... something that feels a bit more "weathered". Ultimately it's going to be interesting to compare Seattle's branding to Vegas's. There doesn't appear to be a Foley-like figure in the organization, which leads me to think that whatever choices Seattle makes will be thoroughly researched and tested. Whether that results in a better brand remains to be seen, but I highly doubt we'll see anything approaching the controversy surrounding the Knights. An abstract native-styled logo from a Native American or First Nations artist would be a good fit with one of the abstract names like Evergreens or Emeralds IMO. Unless we need an angry princess cut emerald swinging a hockey stick. This definitely seems like the opposite of Vegas's branding endeavor. Foley had essentially decided on the team name & colours before even being awarded the franchise (other than the "Golden" prefix & red trim being added later), while it seems like any & all options are on the table here. I'd still probably say Emeralds is my favourite of the names that have been thrown around, with Totems #2, but Sockeyes is starting to grow on me. I'm surprised Kraken has gotten as much traction as it has, but I guess everyone just wants to hear them say "Release the Kraken" before every game. They'll have to walk a bit of a tightrope when it comes to avoiding something derivative of another team's brand. Minnesota is primarily a green team & uses a logo featuring trees, which makes a name like Evergreens tough to pull off. Vancouver has a marine animal logo done in the style of First Nations art, and is blue & green. The Avalanche have the mountain branding pretty much covered. Sonics on ice to tide the fans over. No blue, distinguishes from Canucks. Green, yellow, +/- red. I say -red if it would mean awful red alts. Does metropolitans cause issue with the Mets? No way in hell they're named the Sonics. It's inevitable that the NBA is coming back to Seattle at some point and they will be the Sonics. 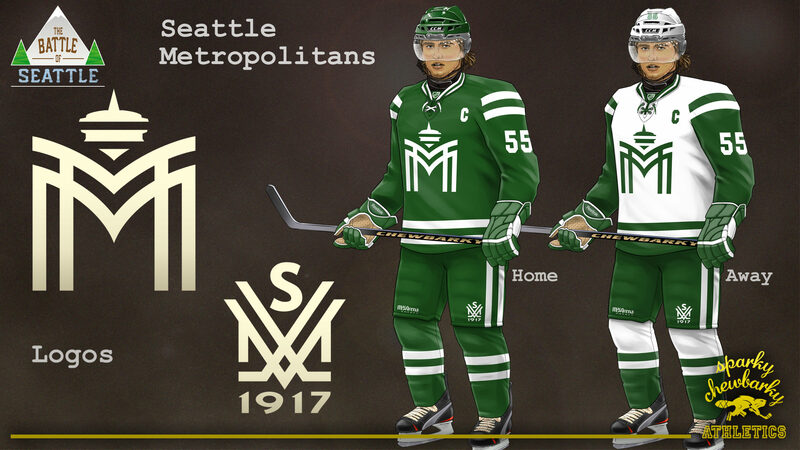 I'm having a hard time finding it for the moment, but over in @sparky chewbarky's Battle of Seattle concept thread, one or two of his concepts we're done up in simple teal and white. Someone tell me why that wouldn't work for the new Seattle team? No team in any of the major pro sports uses exclusive teal and white. This doesn't have to be difficult at all...I think part of the issue is that when new expansion teams come along, we creatives tend to get too creative and thus end up overthinking/overdoing it (yep, I myself am just as guilty of this). What do I mean? We're always digging for the most unique color combo, the most unique nicknames, etc. As I look back, since 2002 or so, I think the Houston Texans was the last expansion team with a simple enough color scheme/name. The OKC Thunder have three or four colors (although they're not really "expansion"). When the Minnesota Wild came out, it was green, red, gold and white, with cream/vintage white mixed in. Look at the Vegas Knights...gray, gold, black and red. Now I'm not saying not to pursue a unique package, but I believe a major source of frustration (and one that, 10 years into my pursuit of this thing I'm just now beginning to realize) comes from trying to do too much at the expense of not even considering the simpler solutions--such as, one-color-and-white (or silver). Done correctly, and this probably speaks to a point @andrewharrington has been advocating for a good long while around here, a simpler colorway/identity can and will go a long way towards building a stronger brand, rather than trying to "woo" with multiple colors and overly fancy logo marks (unless the team nickname allows for that rather easily). A clean, green (or aqua) and white colour scheme, kinda checks 2 boxes...it's unique (in the NHL) and simple...would work for most of the considered names. ...an NHL Seattle identity that is influenced by the tribally-approved use of Coast Salish themes and utilizes a palette of Deep Teal, Red Ochre, Black and White could be visually stunning. 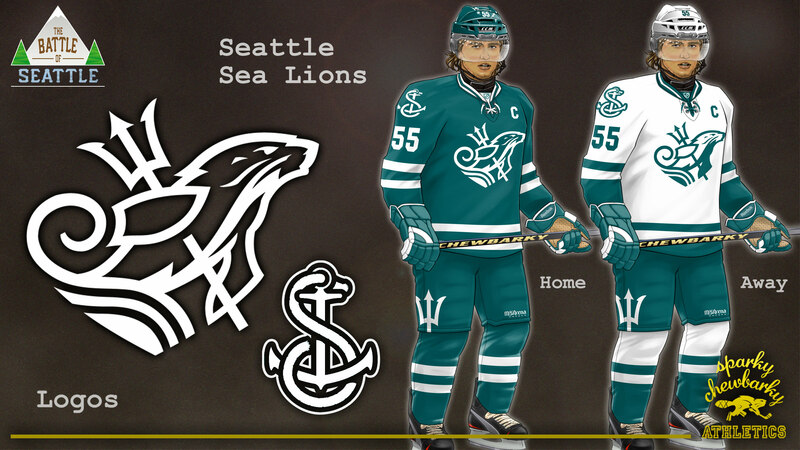 I prefer the "Sea Lions" in green with light blue as a secondary but I can totally get behind the aqua. Love the "Sea Lions'" logo. Yep. The SuperSonics will return and not as a Hockey team.